In All of Us, Adrienne Jansen and Carina Gallegos use poems and short prose to weave together the vibrant, expansive, and sometimes heart-wrenching stories of immigrants and people from refugee background in New Zealand today. 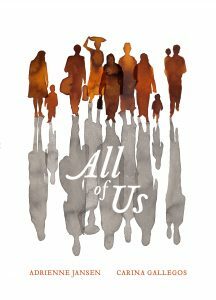 Drawing on their time spent with immigrant and refugee communities, their words delicately lift the veil that separates us, providing a moving exploration of the refugee and immigrant experience. All of Us is a timely reminder of the humanity that perseveres at the core of this global debate. In this collection, Adrienne has been joined by exciting new writer Carina Gallegos. Carina has a background in journalism and development studies. She grew up in Costa Rica, moved to New Zealand thirteen years ago, and has worked with refugee-background communities since 2011. She lives in Wellington with her family. Available from October 2018 from Landing Press and good New Zealand bookstores. Longlisted for the Ockham NZ Book Awards, poetry, 2019. See the video of the title poem from the collection here. Landing Press is a small cooperative press based in Wellington. It will focus mainly, but not entirely, on poetry.